What does your meeple set consist of? I am building up my set of meeples and i was wondering what you have? and if you have created any extra rules for any of them. What else can i add to the set? Re: What does your meeple set consist of? I just have the normal meeples that come with the base game and the first two expansions. But looking at your list I'm very intrigued. what on earth does "the child" and "prostitute" meeple do? is that from an official expansion or a user created expansion? It was an extremely rare mini-expansion you could get from the Cundco website! I believe these are from a home made expansion that Rosco is responsible for. I think he made the Meeples himself. How about the Robber, the Lady, the Phantom, the Dragon(s), the Fairy, the Mage, the Witch, the Missionary (shameless plug)... to name a few. I wasn't including anything which is used by everyone. The prostitute and brothel are from my expansion called The Temptress. Basically the prostitute can be placed as a normal follower but does not count towards any majority on a feature. If the feature is controlled by the same colour as her, the meeples are motivated to work harder so the feature scores 3 bonus points. If it is controlled by an opposing colour, she distracts the meeples thus halving the score (rounded down) of the feature. The brothel works in a similar way but is placed on a crossroads and it stays for the entire game. It affects the score of any feature up to the ends of any of the roads including monasteries, citys , etc. The child acts as a half meeple and can help with gaining a majority. But a child cannot stray far from his guardian so can only be placed on a tile directly adjacent orthogonally, and on the same feature as a normal meeple of the same colour. The sheriff has yet to be finalised as the original rule didn't work very well. Whatever that second meeple is that also goes on the scoreboard from the mini-expansions. I thought I remembered someone calling it a lady or a woman. The Lady to me is the helicopter in the Eighties action series Airwolf. Are you responsible for The Prison? I liked it, the only problem we have is remembering the sheriff is not an ordinary meeple, even if we have personalized the meeple with a sticker. Standard set with messenger/robber as Lord/Lady. If played with Dragon, a meeple with "ritter on horse"-sticker as a "Safe-from-the-dragon-meeple" if we don´t use Outposts. Otherwise it has the moving mechanism as described below for the Captain. 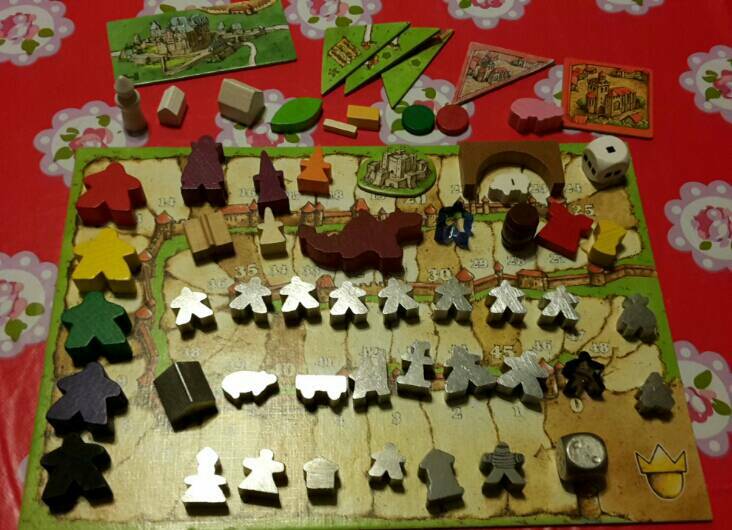 One personalised meeple (agricola-sticker) for each colour as "team captain" (grey are led by a Troll, purple by a Witch etc), a meeple that in the move wood phase can move around structures like a wagon to boost meeple majority or claim unclaimed features or protect a thief from the sheriff, "capo-style". If I had an extra set of wagons, I´d glue the captain onto it to make the mechanic more visibly explained. I´m going to try to glue them onto the horses from Spielematerial, could look cool. A meeple with "ritter"-sticker to be used as The Sheriff. A mini-meeple as The Phantom (wood beats plastic). Oh wait, an ugly-looking giant meeple is used as The Leper. Here you have almost everything. There may be a couple of things missing. Super mega meeple, count, Mage and witch, Castle, bridge, sheep and flier dice. Super mega meeple, Tower piece, fairy, dragon, teacher, cloth,barrel of wine and wheat. Have You Seen This Meeple?